I feel as if my entire sense of time has been warped. Was it only three days ago that my telescope and the eclipse had yet to happen? Did I really drive to the Christmas tree lot yesterday? It's Monday and I am back at work and yesterday after getting the tree, both Scott & I were basically useless. I know the strange schedule and loads of work, cleaning and routine disruptions are to blame. Unfortunately, I still feel completely useless today, which is very bad because so many things need to get done. We've also been in a disappointing holding pattern with the telescope since the night of the eclipse because some poorly timed winter weather arrived (bad move, mother nature!). It's been cloudy & rainy for the last 2 days/nights, and you can bet I am tapping my foot impatiently to get back to some clear nights. On a day where I'm feeling as creatively inspired as a bag of rocks, it only seems fitting that the Radvent challenge prompt for today would be creativity. Maybe it will help me snap out of my funk? I create art via my photography. I create delicious, healthy vegan food that my family loves. I create laughter through dirty jokes, bad puns, the occasional wit & being able to laugh at myself. I create joy in my own life, in the life of my partner & my family. I create collages of magazine cutouts that I never show anyone but Scott; they're just for me. I create a sanctuary where my cats can live the most happy, healthy lives they possibly can. I try to create a life that I am happy with, as happy as I can be with, every single day. I create life ... maybe ... someday? 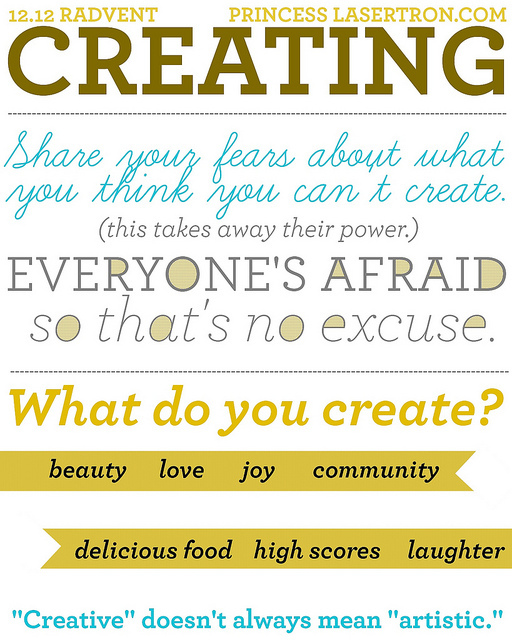 What am I afraid to create? Another life. I wish I wasn't afraid, but I am. I hope I continue to evolve in this area, for a whole host of reasons that I won't get into here ... according to the logic above, everyone else fears this too, at least at one point, so perhaps I shouldn't feel so isolated in it after all.